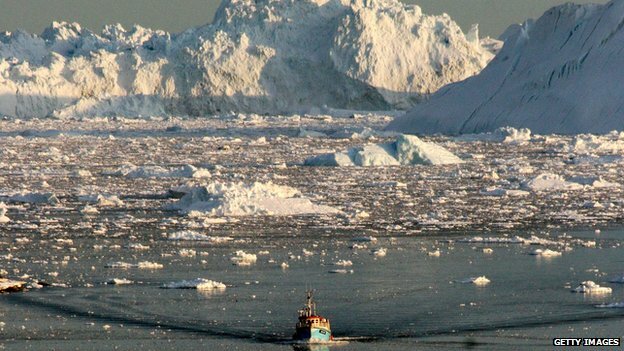 The dynamics of ocean waves in polar regions give us important clues about the behaviour of sea ice in those areas, according to researchers. Could that suggest a ‘feedback effect’: greater distance to land = more ice break-up etc.? Models Wrong Again…Sea Ice Break-Up Caused In Large Part By Storm-Generated Oceanic Wave And Wind Dynamics! Link to NoTricksZone article Follow his link to the Spiegel photos, magnificent. As waves reflect and resonate inside a container or cavity, they cross one another. As they cross, they exchange energy at specific locations called ‘damping wells.’ In quantum mechanics this is explained by Landau-Zener theory (1932). Known as Landau damping, waves that pass through one another mostly transparently, avoiding a direct collision, are called ‘avoided crossings.’ In such cases, energy is exchanged in a ‘parameter zone’ where one wave pushes against another, creating a kind of spinning well or vortex action. Like a kind of switch, energy is passed ‘adiabatically’ (without heat loss) across the damping well in a kind of torque action. 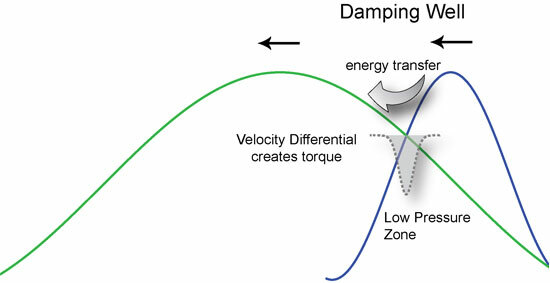 We can think of the damping well as a kind of low-pressure zone much like those in our atmosphere that create storms, hurricanes and tornados. The surrounding pressure differential causes an implosion toward the center of the low-pressure zone, forming a vortex. There is freedom of choosing religion in our country so there is no problem what you or I believe. On the other hand there is a problem when scientists mix facts supported by evidence and laws of nature with fantasy, unfounded hypotheses and faith. 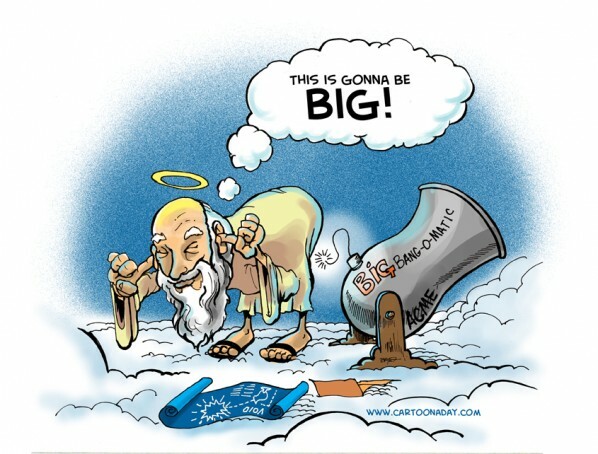 There is no qualitative difference being a creationist believing that earth and our galaxy was created 6000 years ago or believing that the universe was created from a small cosmic egg 14 billion years ago. From where did this egg originate and what existed before that? There must have been something more (or rather, less) than a nuclear bomb within it since at that point not even matter are believed to has existed. None of these beliefs are or can be supported by scientific methods or verified experience. Hence, it cannot be classified as science. A new paper in press at Elsevier finds air pressure changes linked to Forbush Decreases in the extra-tropics. These can affect the regime of blocking highs and the landfall of cyclonic weather systems. 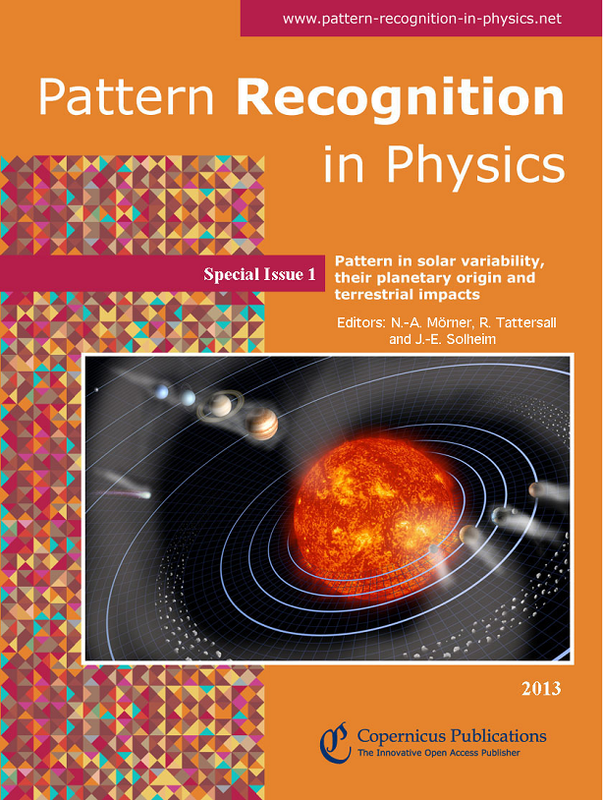 The paper marks a further step forward in understanding solar-terrestrial relations. Changes of troposphere pressure associated with short-time variations of galactic cosmic rays (GCRs) taking place in the Northern hemisphere’s cold months (October–March) were analyzed for the period 1980–2006, NCEP/NCAR reanalysis data being used. Notice- able pressure variations during Forbush decreases of GCRs were revealed at extratropical latitudes of both hemispheres. The maxima of pressure increase were observed on the 3rd–4th days after the event onsets over Northern Europe and the European part of Russia in the Northern hemisphere, as well as on the 4th–5th days over the eastern part of the South Atlantic opposite Queen Maud Land and over the d’Urville Sea in the Southern Ocean. According to the weather chart analysis, the observed pressure growth, as a rule, results from the weakening of cyclones and intensification of anticyclone development in these areas. The presented results suggest that cosmic ray vari- ations may influence the evolution of extratropical baric systems and play an important role in solar-terrestrial relationships. New research has shown the remarkable rebirth of a Pacific atoll devastated by a typhoon over a century ago. The University of Auckland study, published in the journal Geomorphology, highlights the dynamism of island systems of the Pacific over relatively short periods of time. Natural variability seems to be capable of accounting for changes in ocean heat uptake of the magnitude experienced. 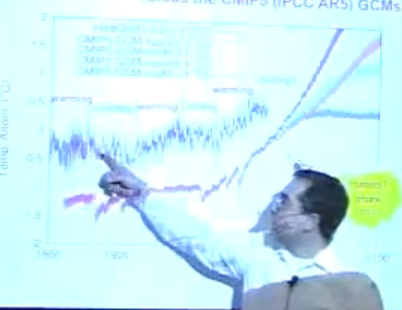 Many recent studies point to the role of PDO in this recent hiatus. What is particularly compelling is that this period has also been one of negative PDO. Further suggestive evidence is that the last period with decade-scale trends in global mean temperature as weak as that experienced since the turn of the century occurred through the 1950s and early 1960s, which was another period dominated by very negative PDO conditions. This shows that hiatus periods are unusual but not unprecedented. Mat Collins of Exeter University admitted to the world a week ago that the direct cause of the UK’s wet and windy winter was/is the North Atlantic Jet Stream. It has been directly responsible for the ‘conveyor belt’ of powerful storms which have hit the UK, one after another, in seemingly endless succession, since December 2013 all the way into February of this year. The rain precipitated by those storms has resulted in widespread river flooding. In addition, a particularly deep depression which coincided with a very high tide on the 5th/6th December also resulted in fairly severe coastal flooding along eastern coastal areas. Nothing as bad as the devastating tidal surge of 1953 but that was more down to massively improved flood defences in the last 50 years. 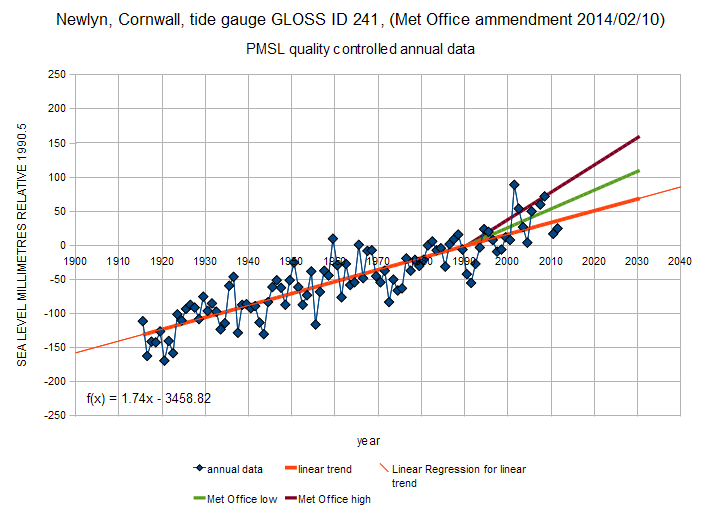 The Dec 2013 tidal surge was probably only a shade less menacing in terms of actual sea level rise than was the 1953 event. 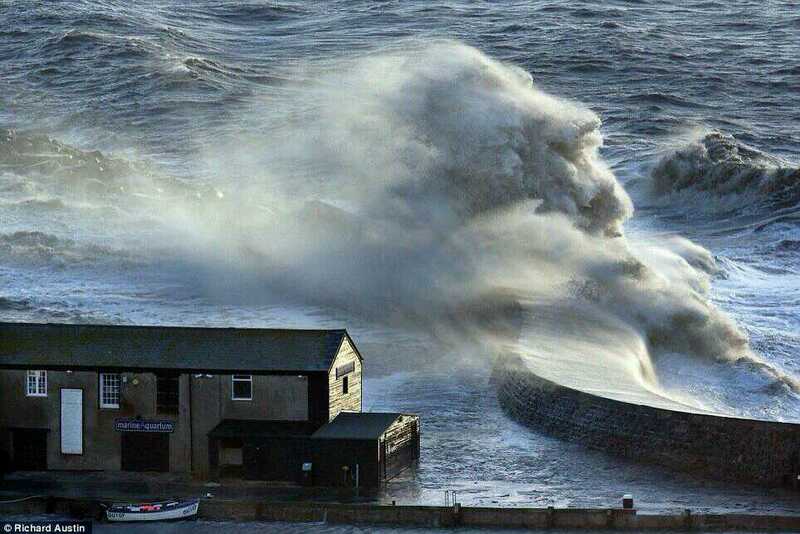 Severe gales and storm force winds have also driven huge waves over sea defences in Wales and the West Country, resulting in yet more localised flooding. 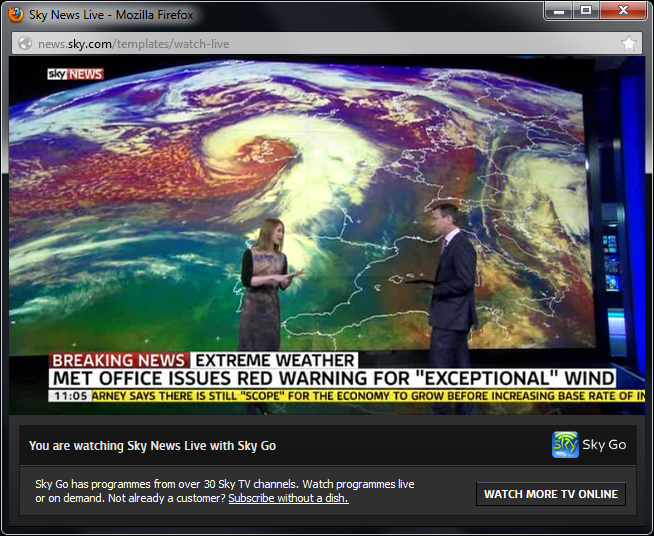 All this chaos due to the Jet Stream, due to the run of extreme weather caused by that Jet Stream. 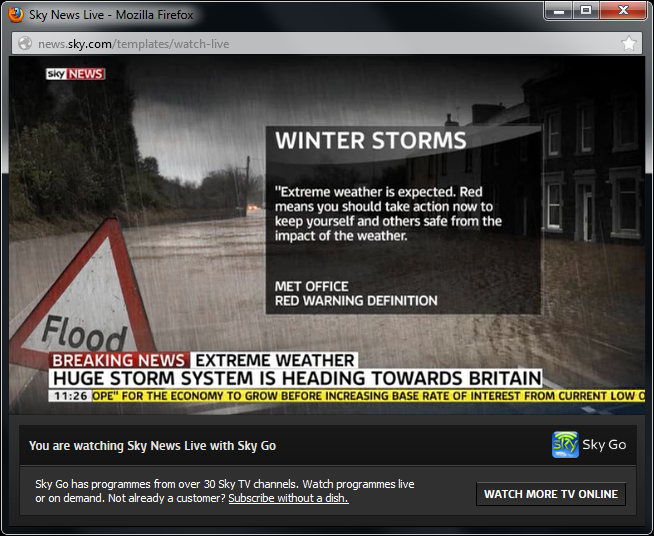 But, given the exhaustive news coverage and the opportunity for a propaganda coup, it was inevitable that the proponents of CO2 induced global warming would figure out some way to link in the storms with ‘climate change’ and, right on cue, up stepped Julia Slingo to claim that ‘all the evidence’ pointed to a link between the UK floods and ‘climate change’. An earlier 2010 paper finds a fourth planet in the system as part of the resonant coupling. The existence of multiple planetary systems involved in mean motion conmensurabilities has increased significantly since the Kepler mission. Although most correspond to 2-planet resonances, multiple resonances have also been found. The Laplace resonance is a particular case of a three-body resonance where the period ratio between consecutive pairs is n_1/n_2 near to n_2/n_3 near to 2/1. It is not clear how this triple resonance can act in order to stabilize (or not) the systems. The most reliable extrasolar system located in a Laplace resonance is GJ876 because it has two independent confirmations. In the old days we would have drowned a witch to stop the floods. These days the Green Party, Greenpeace and Ed Miliband demand we purge the climate sceptics. Batten down and hang on. 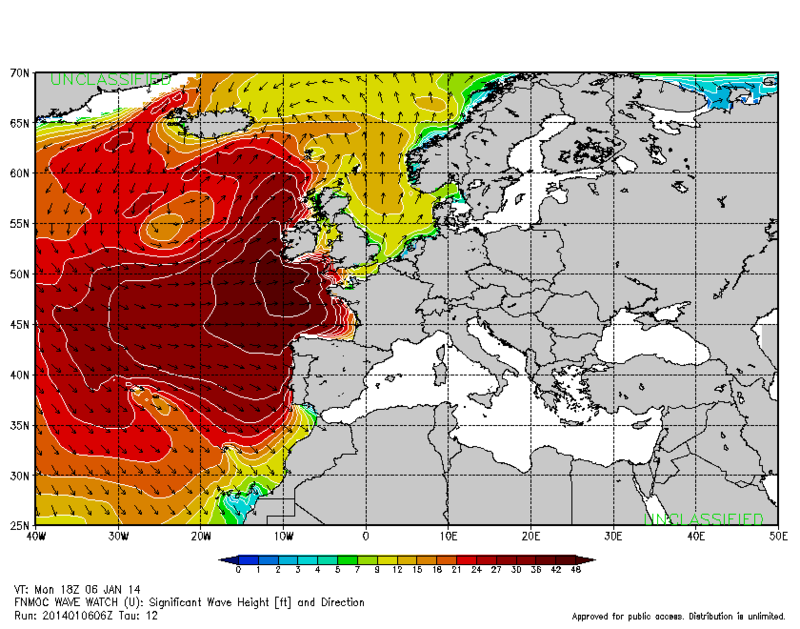 100mph gusts expected on coasts and exposed ground. According to Richard Betts, a Met Office go between, an original publication omitted fundamental information in relation to forecast. It has now been amended by adding a base date of 1990. The projected SLR of 11-16cm by 2030 for the English Channel comes from the UKCP09 projections, see this report, Table 2, columns for “High” (16.0) and “Low” (11.4) for London. But crucially, these numbers are relative to 1990 (the UKCP09 baseline), not 2014. This was not stated. Clearly there’s been some sea level rise since 1990, so the numbers between 2014 and 2030 would be smaller. The omission led to the impression this was a new forecast when actually it is historic and I suggest misleading. UK09 is a report using a near 20 year old baseline. Betts says this is for London! London is on sedimentary strata and an artesian well, plus ground conditions are unstable. Is that for a gauge or a model guess? Why choose a London projection then play switch to English Channel? Seems odd to me. Unimportant, the sea level change over a wide area is around 1.7x mm/year where London will be the same. My figure of 1.74, came from a few seconds of software run here on annual data. What follows shows 1.77 is closer, of no importance. 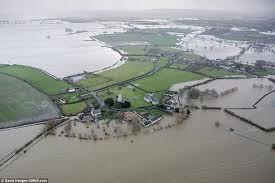 Met Office Report Says Sea Levels Likely to Rise 11-16 cm by 2030? Ruth Dixon spots a curiously unreferenced assertion in the MET-O’s new report backing Dame Slingo’s reframing of the weather as climate. Update 11 Feb 2014: Met Office says Oh, you thought we meant from now? No, from 1990! See comment from Richard Betts, below and the updated Met Office report. 13 Feb: A further comment from Richard confirms that the Met Office projections for UK sea level rise are 5 to 7 cm between now and 2030. Reposted from Notes on a Scandal Excellent analysis on Julia Slingo’s reframing of the relationship between ‘climate change’ and ‘weather’ by guest blogger Jaime Jessop. It’s happened. The battle lines have finally been re-drawn. Global surface temperature rises (which have been inconveniently static for 17+ years) have been ditched by the warmists in favour of the new CAGW meme – extreme weather. The opportunities for making unfalsifiable claims are endlessly more expansive and the sheer headline-grabbing power of ‘big weather’ far exceeds that of mere ‘global warming’. The remarkable UK Cyclonic Winter of 2013/14 – still ongoing as we speak – has afforded the warmist politicos an eagerly awaited unique opportunity to climb firmly aboard the extreme weather bandwagon and claim that it’s all down to CAGW branded ‘climate change’ (patent pending). Hence Dame Slingo of the UK Met Office now claiming definitively that ” “all the evidence” supported the theory that climate change had played a role” in the devastating West Country floods. Julia Slingo: Shark jumping in the winter storms. Climate Change is a key factor in the storms that have battered parts of Britain this winter, according to the Met Office’s chief scientist, who also warned that the country should prepare itself for similar events in the future. Dame Julia Slingo said while there was not yet “definitive proof”, “all the evidence” pointed to Climate Change, and suggested that detecting when and how storms develop would become increasingly important. According to new analysis from the Met Office, persistent rainfall over Indonesia and the tropical West Pacific triggered a global weather system that included the severe storms that have flooded thousands of homes in Britain, as well as the exceptionally cold weather in North America. 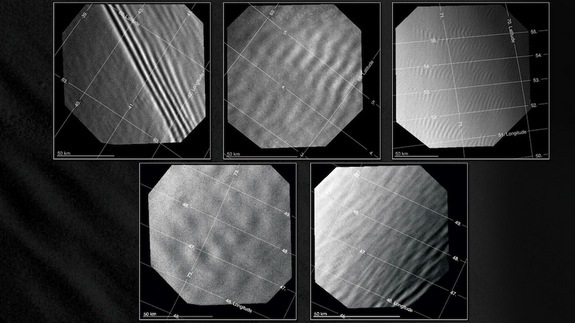 European spacecraft circling Venus has captured high-resolution images of strange waves in the clouds whirring above Earth’s nearest neighbor. These ripples could help scientists understand how Venus’ hellish surface shapes its atmosphere.On Venus, mountains and volcanoes rise above vast lava plains and temperatures are hot enough to melt lead. But this hostile landscape is largely obscured by the planet’s dense, toxic atmosphere with clouds blown by winds up to 186 to 248 mph (300 to 400 km/h). Here in the UK there is complaining about a period of stormy weather, claims of never seen it before, except I have and worse. Flooding, some way to go here been much worse. What though is going on? Simple enough, there have been some large depressions mid Atlantic, waves freewheel from there, combines with high tides to produce spectacular effects. The depressions starting to dissipating before they arrive so we get a gale on exposed coasts, always have, always will. Cherry picking gust speeds is cheating, fool phrases such as “hurricane force gusts”.. and the gust speed in a hurricane? Today the Mail Online have a lead item on well, trying to make something of another storm arriving but more an opportunity to show some fun photos. Some 0.2in (5mm) to 0.4in (10mm) of rain could fall in less than an hour, with locally 0.6in (15mm) to 1in (25mm) of rain through today and perhaps as much as 1.6in (40mm) on high ground, forecasters say. 5 to 10mm in an hour, I’m trembling! LAGOS, Nigeria (AP) — About 100 feet down, on the bottom of the Atlantic Ocean, divers had already pulled four bodies out of the sunken tugboat. Then a hand appeared on a TV screen monitoring the recovery. Everyone assumed it was another corpse, and the diver moved toward it. “But when he went to grab the hand, the hand grabbed him!” Tony Walker, project manager for the Dutch company DCN Diving, said of the rescue in May. Harrison Odjegba Okene, the tug’s Nigerian cook, had survived for three days by breathing an ever-dwindling supply of oxygen in an air pocket. A video of Okene’s dramatic rescue — http://www.youtube.com/watch?v=ArWGILmKCqE — was posted on the Internet more than six months after the rescue and has gone viral this week. 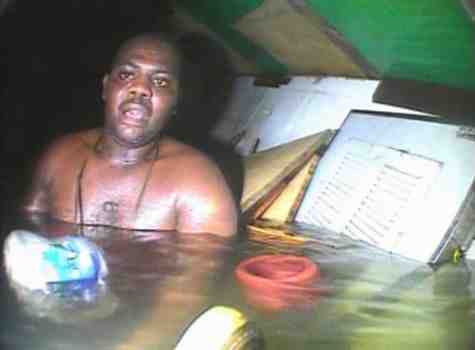 To this day, Okene believes his rescue after 72 hours underwater was the result of divine deliverance. The 11 other seamen aboard the tug Jascon 4 died. On the video, there was an exclamation of fear and shock from Okene’s rescuers, and then joy as the realization set in that this hand belonged to a survivor. “What’s that? He’s alive! He’s alive!” a voice can be heard exclaiming.